TSPSC Deputy Surveyors Marks list Results, Selected candidates list 2018: TSPSC Deputy Surveyors Selection List Results, Certificates verification dates 2017, Web option dates/ TSPSC Deputy Surveyors Recruitment 2017 Answer Key, Selection List Results/ TSPSC Deputy Surveyors Recruitment 2017 Hall tickets, Exam on August 20/ TSPSC Deputy Surveyors Recruitment 2017 Edit Option, Bio Data Corrections, Online application form corrections /TSPSC Deputy Surveyors Recruitment 2017 Online application form/ TSPSC Deputy Surveyors Recruitment 2017in Survey, Settlements, Land Records Department: #TSPSC to fill 273 Deputy Surveyors in Survey, Settlements and Land Records Department, TSPSC Deputy Surveyors Recruitment 2017, TSPSC Survey Settlement and Land Records Deputy Surveyors Recruitment 2017, Survey Settlement and Land Records Posts recruitment, TSPSC Survey Settlement and Land Records Deputy Surveyors Recruitment online application form, Eligibility criteria, How to apply, Exam date, Hall tickets, Answer key, Results and other details given here. TSPSC has published the Deputy Surveyors Recruitment 2017 notification on June 1 and applications are invited Online from qualified candidates through the proforma Application to be made available on Commission’s WEBSITE (www.tspsc.gov.in) to the post of Deputy Surveyors in Survey Settlement and Land Records Subordinate Service. TELANGANA STATE PUBLIC SERVICE COMMISSION :: HYDERABAD. 1. It is hereby notified that on the basis of the CBRT Examination held on 20/08/2017 to the posts of Deputy Surveyors in Survey Settlement and Land Records Department, the candidates with the following Hall Ticket Numbers have been provisionally admitted for the Verification of Certificates, Subject to Court Orders, if any. one set of check list and two attestation forms in original duly filled which are available in the Commission’s website and all Original Certificates along with one set of Photostat copies duly attested by Gazetted Officer, relating to Age, Qualifications, Community (Integrated), Latest Creamy Layer exemption certificate in case of B.Cs as per Memo No.3009/BCW/OP/2009, Government of Telangana, Backward Classes Welfare (OP) Department, Dt:18/12/2015 (prescribed format hosted on website), Certificates relating to claim of age relaxation, Study (from 4th class to 10th class) and if any, at the time of verification of documents, failing which, they will not be admitted in subsequent process of selection. No request will be entertained for subsequent submission of any of the above certificates. 3. The Verification of Certificates is scheduled from 14/12/2017 and 15/12/2017 at 9.00 AM onwards at Sankethika Vidya Bhavan, Beside Govt. Polytechnic College, Masab Tank, Hyderabad. The Candidates are instructed to produce all the original Certificates as mentioned in the Notification on the same day without fail. 4. The candidates are requested to obtain and keep ready all the certificates as mentioned in the Memo. If, on further Verification it is found that any candidate is not eligible with reference to the particulars furnished by him/her in the Application Form / Check List / Certificates, the results of such candidate / candidates shall be cancelled at any stage of selection process. 5. The Commission reserves right to disqualify any candidate, if he/she is not found eligible for any reason at any stage. Admission to Verification of Certificates does not confer ipso facto any right for Final selection. 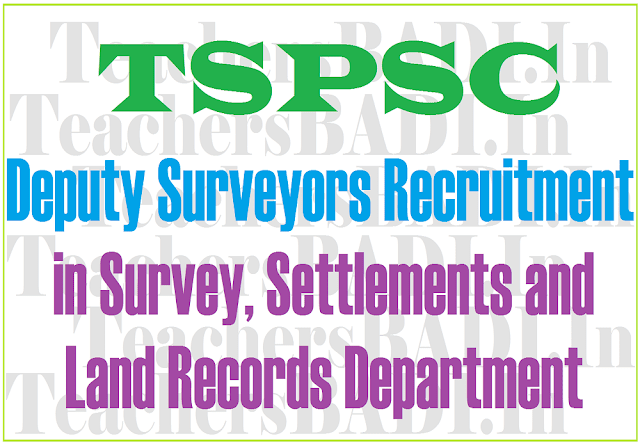 TSPSC Deputy Surveyors Recruitment 2017 Edit Option, Bio Data Corrections, Application form Corrections: The candidates who have applied for the post of Deputy Surveyors in Survey, Settlement and Land Records Department are hereby informed that during recruitment process it is observed that, the candidates are often committing mistakes in filling Bio data in their respective applications and requesting TSPSC for Bio data corrections in their respective PDF applications. But it is not feasible for TSPSC to make corrections in candidate’s respective applications, as it is the candidate’s responsibility to fill the application form correctly. In view of the above, it is decided to give a chance to the candidates to correct their wrongly entered data by way of giving Edit Option. In this regard, the candidates are directed to go through the following instructions. 1. Candidates are strictly informed that this Edit Option will be considered for one time only. Hence, the candidate should show utmost care while using Edit Option as this Data will be considered up to final selection. 2. The candidates are instructed to view their Bio-data in PDF which is made available to him to easily identify the wrongly entered data that he entered in his/her respective application; candidates may download their corrected PDF for future reference. Post Code Name of the Post No. of Vacancies Age as on 01/07/2017 Min. Max. Scale of Pay Rs. The Examination (Objective Type) is likely to be held on 20/08/2017 FN. The Commission reserves the right to conduct the Examination either COMPUTER BASED RECRUITMENT TEST (CBRT) or OFFLINE OMR based Examination of objective type.